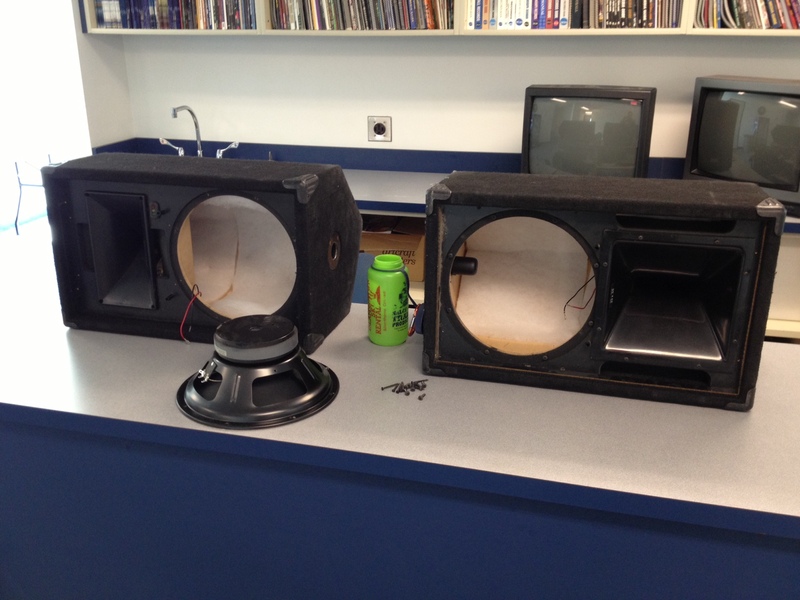 Once upon a time there was a dealer that loved selling Community loudspeakers to MSU Bozeman. Long throw, 3-way mid/hi horns, “full-range” weatherproof public address units, portable monitor/utility speakers… the university bought them all. The latter units still see regular use. My department owns a pair of XLT41 12″ 2-way boxes and a pair of XP502s, also 12″ 2-way boxes (though I’ve only seen one of them, the other is still exists only in legend). Both models are very similar, featuring bi-amp capability, NL4 interconnects, black carpet finish, pole-mount sockets and a form factor that allows them to be used as stage wedges. The main difference upon visual inspection is the HF section. The XLT41 features a “rotatable” (see also: square) 90×60 degree horn while the XP502’s horn is a rectangular, 90×40 degree. In my last post, I mentioned my ongoing quest of testing the department’s tech inventory to get a better handle on what we have to work with. Well, I already knew one of the XLT41 boxes had a non-functioning woofer. Funny story, during my interview, they staged a small “practical” for me to participate in, which consisted of setting up a portable PA system in a presentation scenario with laptop, microphone and projector. After completing the task and firing up the system, I noticed the woofer was out and informed those overseeing. Now that I have the job and the woofer is still not functioning, I pulled it out, took a meter to it and lo and behold I metered nothing–an open circuit. I took the woofer back to the office and started looking for a recone kit or replacement driver. After typing in the numbers listed on the magnet, I realized the XLT41 and XP502 share the same woofer–which would explain why their performance is so similar on paper. Given the XP502 is currently missing its significant other, I opted to pull the working woofer from it and drop it in the XLT to give us a matching, working pair. Now, one detail confused me a little. While looking at the spec sheets for each box, the nominal LF impedance was listed as 8 ohms. However, the sticker on the woofer says 4 ohms. This was discrepancy consistent between all woofers. Here are the boxes next to one another, woofers out. XP502 on left, XLT41 on right. While I had the grille off, I figured I’d go ahead and use that “rotatable horn” feature of the XLT41. The horn had been set up so that the wide dispersion was in the horizontal plane when being used as stage monitor, on its side. I’d say 95 percent of the time it’s getting used on a speaker stand, so I turned the horn to get that 90 degrees of horizontal dispersion when upright. By this time, I’d spent enough time with these speakers that they were growing on me. Yes, they’re cheap boxes in the scheme of things, but they’ve obviously served their purpose over the years, fulfilling the needs of many, many events, all the while holding up to the abuse of tired student workers packing them up after long Friday night shifts. Though, I will say I discovered a new level of cheap manufacturing when I pulled out that horn. Notice the horn doesn’t actually have bolt holes for the driver. 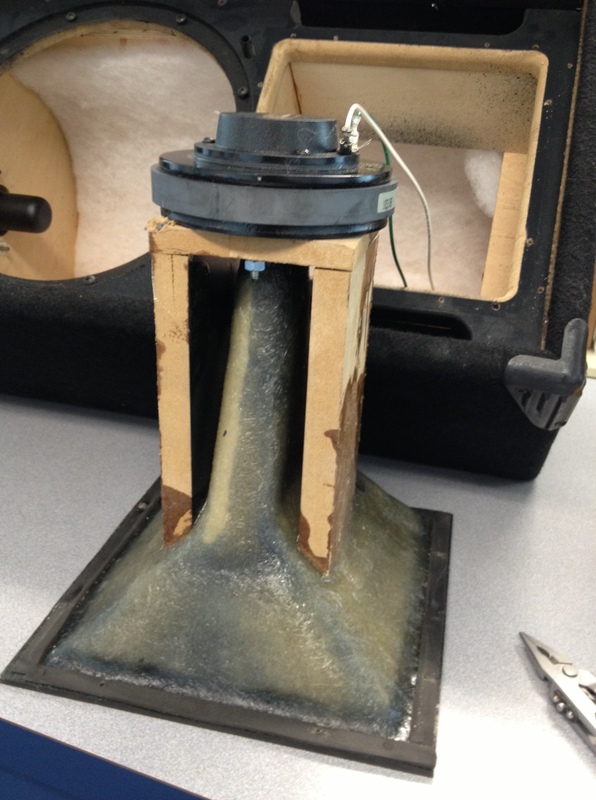 Instead they opted to glue some pieces of fiber board to the horn, staple on a baffle and bolt the horn to it. The staples were starting to pull loose, so it was only a matter of time before the driver fell off on one of those late-night strikes. I grabbed some wood screws and secured the baffle back to its counterparts. The XLT41 now has a working woofer. Though I should still pull the horn out of the other box and reinforce it, as well. Now regarding the empty hole in the XP502. It seems Community no longer has parts for this 11-year-old box, but I do know from the sticker on the magnet the speaker is 4 ohms and was manufactured by Eminence. Perhaps this replacement will do the trick. Edit: I had inferred parts were unavailable judging by info from Community dealers on the web, however a quick call to Community support revealed that parts are indeed still obtainable. A replacement woofer is $141–a bit pricey in my mind, but at least I know I’m getting the real deal.